I love any excuse to celebrate. Seriously… any excuse. When I simply make it through the work week, I pull out all the celebratory stops on my way towards the weekend! So what’s the perfect side dish to celebrate with this Thanksgiving? 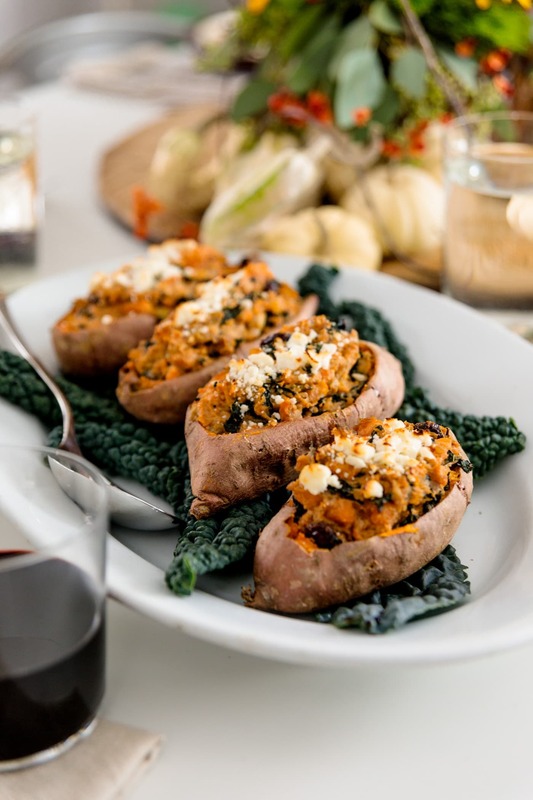 These incredibly delicious twice baked sweet potatoes of course! Since celebrating is in my nature, when there are actual holidays, I’m at my best. I love to plan menus, use my best dishes (I collect numerous sets) and deck the house to the nines. But I know we don’t always have time to go all out and I understand that’s not some people’s cup of tea. 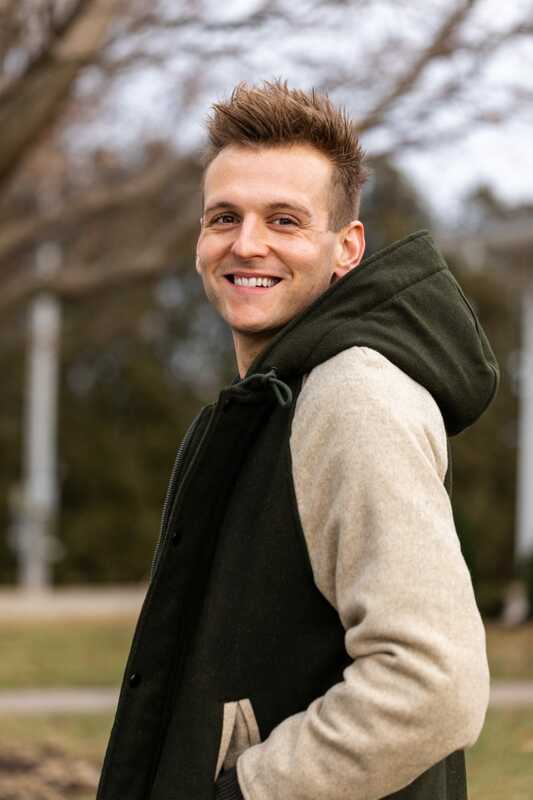 Life is busy and we don’t all collect dishes – I see you rolling your eyes. Even if you don’t plan your holiday festivities weeks in advance, Thanksgiving is the perfect time of year to appreciate good food. And whether it’s small or large, the menu doesn’t particularly matter when you’re surrounded by family and good friends. As long as the food is good, everyone will be happy. 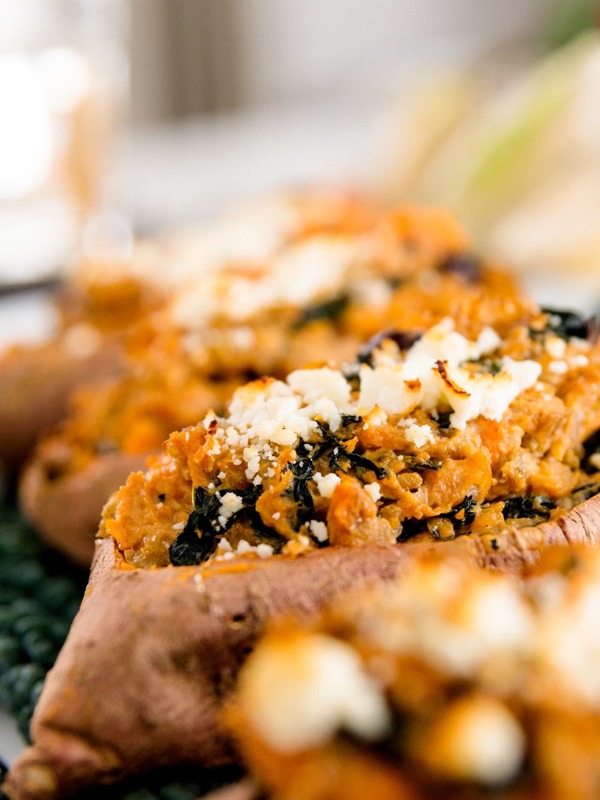 What’s so great about this sweet potato recipe is that it does both of these things. With a combination of kale, dried cherries (you could totally use cranberries as well if you’re feeling super festive) and a bit of tanginess from the Greek yogurt, a unique flavor palette emerges. Plus, can we talk about that little bit of feta on top – yum! It browns just slightly when baked the second time. These sweet potatoes have been on my Thanksgivin menu the last two years and if my family has any say, they will be this year as well. This is the perfect make-ahead side dish with great flavor! 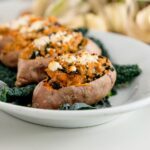 I love to pair these sweet potatoes with complementary recipes that are also perfect for Thanksgiving: my favorite Thanksgiving turkey, delicious biscuits sprinkled with herbs and cheese, and of course the best pecan pie. There’s no need to settle for regular potatoes at Thanksgiving! 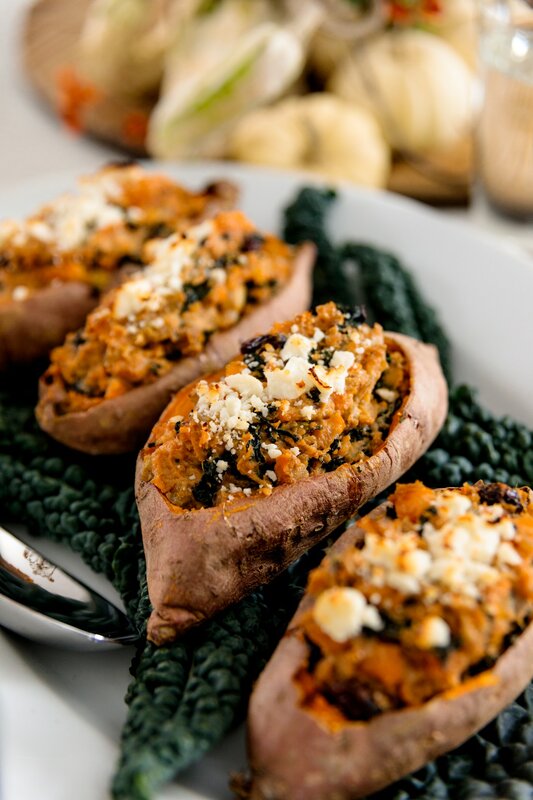 These twice baked sweet potatoes elevate the ordinary potato flavor and turn it extraordinary! Wash and dry the sweet potatoes. Prick each potato with a fork and place on a parchment-lined baking sheet. Bake until tender, approximately one hour. When a knife inserted meets no resistance, the potatoes are ready. Remove from oven and cool. Once cool enough to handle, cut off the top quarter of the potatoes with a sharp knife. Scoop out the flesh of the potatoes leaving about 1/4 of an inch around the edges to keep the shape of the potato. Also scoop out the top cut piece and set aside. In a large skillet, heat the olive oil over medium heat. Add the onion and celery and sauté until tender and translucent, about 5 minutes. Add vinegar and honey and stir to combine. Add the kale and sauté until the kale wilts, approximately 2 minutes. Remove from the heat and add the yogurt. Stir until completely combined and taste for seasoning. Spoon the filling into each empty potato, mounding the top. There will be extra filling, which can be baked in a separate small dish. Top with some feta cheese and place back into the oven to warm through and brown the cheese, approximately 5-8 minutes. The potatoes can be assembled a day before serving. If doing so, cover with plastic wrap and chill after the potatoes are filled. When ready to serve, let warm to room temperature for one hour before baking.